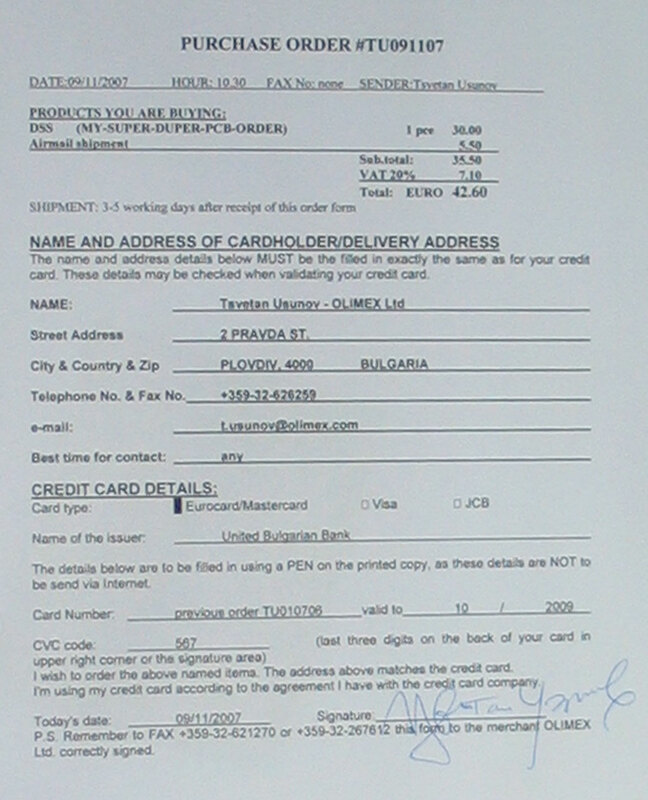 Accounts/organization's purchase orders: We do offer Net30 credit terms to approved customers. We do not offer any other terms. To apply, email info@olimex.com, note that to have approved account one of our conditions is your purchases to be minimum EUR 1000 per month and you should have been our customer for at least six months, if you do not meet these criterias please do not apply for Net30. Is my card info sefe with Olimex? We have strict company policy for the card info. The access to this info is restricted to only few Olimex employees in our accounting where the fax numbers written on the PO form are located. The database is not on file or online but kept on paper copy only (your PO form which is in our archive). Can I pay by card if my request is sent from Anonymous e-mail account like Gmail, Yahoo, Hotmail etc.? Yes you can, but if you are first time customer we must verify you are legitimate cardholder and to be sure that this is not credit card fraud attempt. For this purpose when we receive your PO form we'll first charge small random value under EUR 1.00 to your card and will wait you to report back what is the value we charged. Once you are verified as legitimate cardholder you can continue ordering from anonymous account without future verification. I want to pay in cash when receive the parcel, can you ship C.O.D. (cash on delivery)? No, we can't ship C.O.D. I'm not first time customer. I got PO form, should I send fax with my card info every time I order with card?